Devtrio Group - Excel, Word, PDF .NET components and converters for C#, VB.NET. Excel Reader & Writer API Hot! Increased the stability of the Excel Reader and fixed issues of excel format. New changes for improvement of Excel file creating/writing. New updated version of the WordTextron processor for woriking with doc, docx, rtf files. Improved the parsing of Excel file structures. Improved precision of HTML to Excel converting. Devtrio Group is focused on developing software components for Microsoft .NET platform and related technologies. With a variety of file formats and converting .NET components, Devtrio Group helps developers worldwide to become more productive and maximize their investments by delivering reliable solutions on time. Many of the world's most important companies, government agencies, banks, and universities use our converters in consisting of large-scale projects with success. All components are 100% .NET and consist of just a single .NET assembly without any third-party dependencies which makes deployment extremely simple. All of our components come with complete documentation & examples (C# VB.NET) that cover frequently asked questions. With help of demo versions developers can easily test our .NET components in the real-life projects. Various manipulations with Excel XLS files through the product API. New standalone Excel Jetcell .NET component will be useful for C# & VB.NET developers in read/write Excel XLS and XLSX files, Excel Reports, export data to Excel files or show data from Excel files in ASP.NET website. Excel Reader is a .NET professional component that enables .NET developers to read Excel Spreadsheet files ( XLSX XLS CSV ) from ASP.NET applications. The Excel spreadsheet is represented as a tree structure and managed by API. Converter Html To Excel .NET can export Html to Excel in .NET. Developer has a chance to specify the index of Html table. Also Html To Excel converter has capability to read/write Excel files: XLS, XLSX, CSV. Word Textron .NET component provides developers with abilities to Read, Write and Convert Word files DOC, DOCX, RTF. Also it includes methods to export from/to HTML document. Free version is based on the full version of the powerfull Word Textron .NET component. User is able to create simple Word with minimal docuemnt formatting. Supported word formats: DOC, DOCX, RTF. 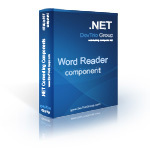 Word Reader .NET component helps a developer to read word documents (DOC, DOCX, RTF) including text formatting and document elements such as lists, tables, images etc. Word Writer is a reporting .NET component. A developer can easily compose any sophisticated report and save it to Word document. Supported word file formats: DOC, DOCX, RTF. Word To Html .NET converter offers an easy-in-use and fast method of converting MS Word DOC, DOCX or RTF documents to Html format. A developer needs just one function call to do the conversation. With help of Html to Word .NET converter a developer need just a couple line of code to convert HTML to Word. The converter creates exact copy of the source document in one of word formats: DOC, DOCX, RTF.